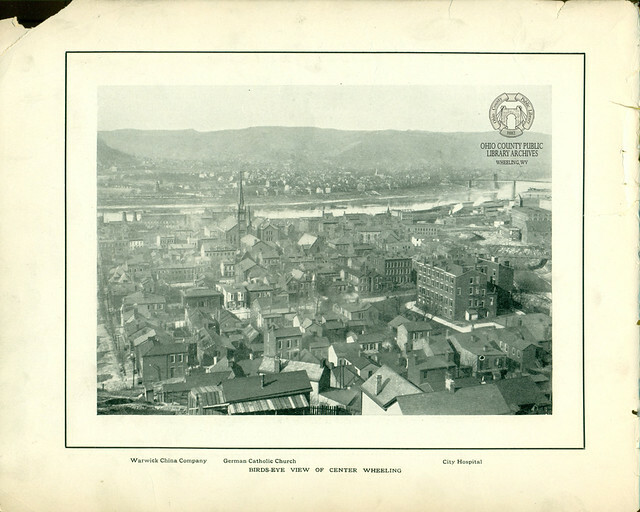 This booklet, Souvenir of Wheeling, was published in 1905 exclusively for J. G. McCrorey & Co., Wheeling, West Virginia by J. H. Nelson Co., Portland, Maine. J. G. McCrorey and Co. stores were five-and-dime that sold a wide range of inexpensive household goods. By 1885, the chain had five stores in Pennsylvania and soon spread throughout the country. At its peak, McCrory's operated about 1,300 stores and employed 25,000 people across the country. In addition to selling shoes, clothing, housewares, fabrics, penny candy, toys, and cosmetics, the J.C. McCrorey & Co. Stores created custom postcards and souvenir booklets to sell in their local stores. This 26-page “Souvenir of Wheeling,” was just one of many made for J.C. McCrorey & Co. in the early 1900s. “Souvenirs” of Reading, PA, Johnstown, PA, Norfolk, VA, and Memphis, TN feature similar formats. The 1905-06 Callan’s Wheeling City Directory lists locations for McCrorey, J. G. & Co. at 1140 Main & 1223 Market under the general heading of Five & Ten-Cent Stores. First founded by John Graham McCrorey of Scottdale, PA in 1882, it is rumored McCrorey was so thrifty, he legally dropped the ‘e’ from his last name so he would not have to pay for extra letters on his store signs. Whatever the reason for the letter drop, the store began showing up as J.G. McCrory & Co. by 1907. A long-lived institution, the company survived a 1933 bankruptcy and went on to acquire several other five-and-dime businesses, including G.C. Murphy, before filing for Chapter 11 in February of 1992. After a decade of financial struggles, the final J. G. McCrorey store closed in Harrisburg, PA in 2002. Original copies available in the Archives and Special Collections [Call #: Wheeling 975.415 Souv] To view this item, please call 304-232-0244 to make an appointment.